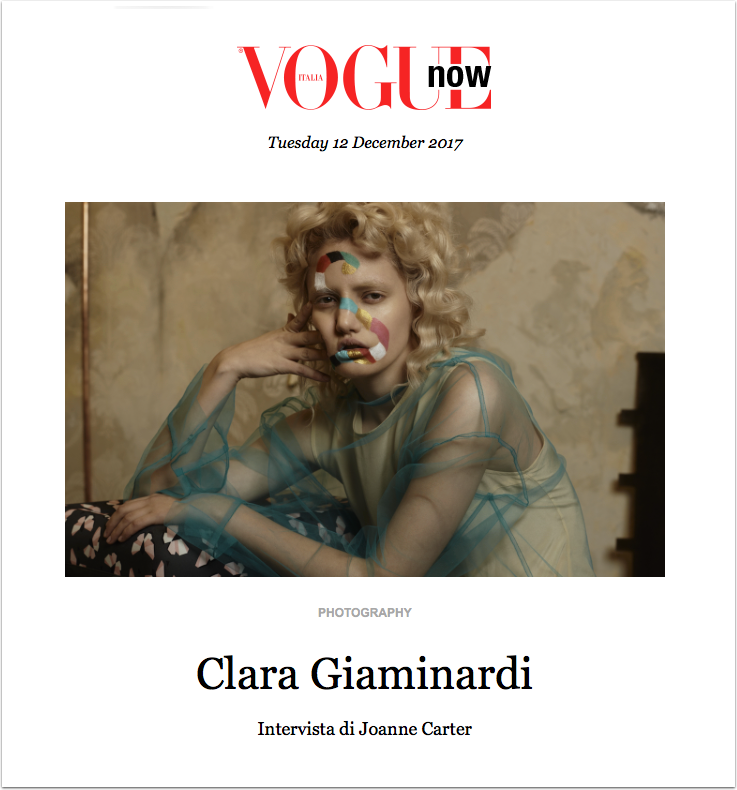 My Latest Vogue Column Interview Published with Photographer Clara Giaminardi Today! I am beyond ecstatic, my latest interview has just been published to Vogue and when this happens, I am always thrilled. This time, I interviewed the incredibly talented photographer, Clara Giaminardi, I utterly adore her work. “Cascading into the world in 1992, Italian visual linguist, Clara Giaminardi’s later emergence into the photographic cosmos represents a deeply personal, complex and largely enduring oeuvre. Consisting notably of visceral, primordial and emotional portraiture that she describes as “creating a mirror to discover the self through the other,” in this conversation with PhotoVogue Columnist, Joanne Carter. Read more at Vogue, here. Read moreMy Latest Vogue Column Interview Published with Photographer Clara Giaminardi Today! So excited! My latest Vogue interview has just been published, this time I interviewed Niko Giovanni Coniglio. Conigilio is an extremely talented photographer and I adore his work. “Tuscany-based photographer Niko Giovanni Coniglio (1987) has developed a portraiture oeuvre rooted in his quest to establish and deepen his relationship with his mother. His latest series of work, ”Daniela, Portrait of my Mother” includes photographs of her naked body and looks to the complexity of their relationship. This series shows Coniglio’s mother over a long period of time and it is one of continuum, he describes it as a ‘life project’”. Please read more of this interview, here. 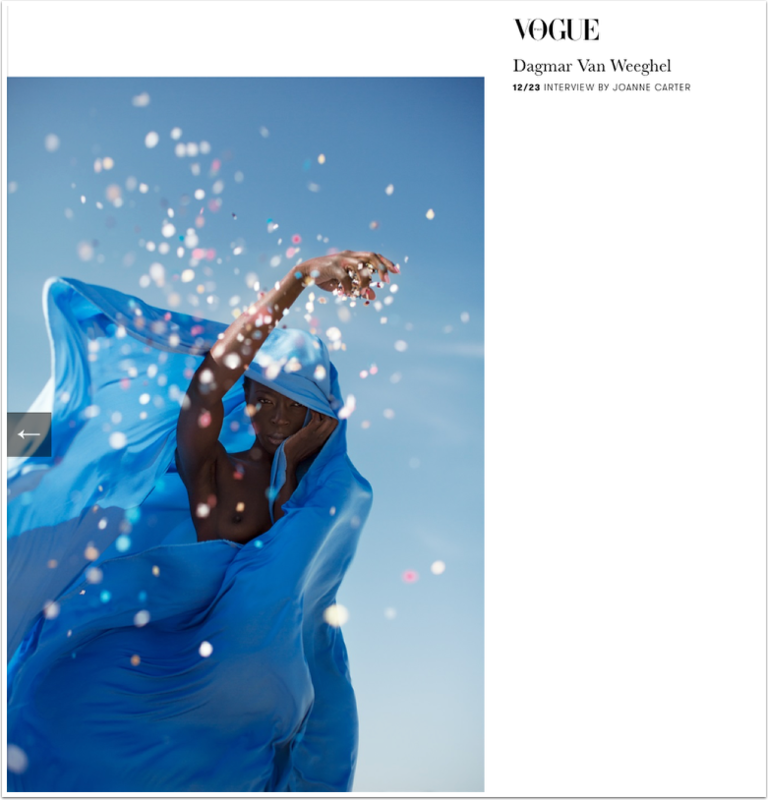 My column at Vogue looks at the philosophy of the photographer as well as their incredible portfolios. I love it when my work is published in Vogue and I think you will love to read this too. Alice Rosati is a very talented photographer. 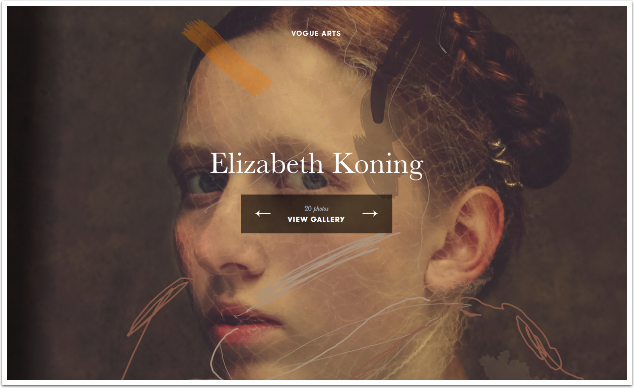 My column looks at the philosophy of the photographer as well as their incredible portfolios. I am so pleased to see my latest article for my column at Vogue has just been published. This time I interviewed the fabulously talented photographer, Kiki Xue. “Xue’s photographic work is marked by his belief that ‘true beauty lies within’, and there’s magic to be found. His eye is seasoned by his appreciation of art history representing Eastern and Western Cultures both traditional and modern. As he explains, “photography emphasizes the drawing part and portraiture is only a carrier of design. They are combined with each other. I like to observe different faces with different stories. For me, portrait photography puts a face to the story in my mind. It is a combination or collision of two stories, producing beauty or a sense of clash”. I am so pleased to see my latest article for my column at Vogue has just been published. This time I interviewed the stunningly talented photographer Heather Evans-Smith. “Inspired by the deep emotional qualities of photographers Francesca Woodman and Sally Mann; their influence seeps into the soul of her images. Unlike Woodmann, who preferred to work in old buildings, where the cracked plaster and grimy floorboards lent the pictures a creepy Gothic sensibility; Evans-Smith unearths her beautiful home as studio and setting for her fantastical shoots. In presenting her ingenuity to us, her photographs remind us of our own capacity to dream and in some cases, recall”. Read more here. Yes, yes, yes, I just love writing for Vogue and I am so delighted to announce the latest article to my Column has just been published. This time I interviewed another incredibly talented, strong and wonderful female photographer – Uldus Bakhtiozina. She’s a huge inspiration to me and I am sure, to so many of you too. This is a long interview, I had so much fun writing it, grab a coffee and sit down for a few minutes of bliss.